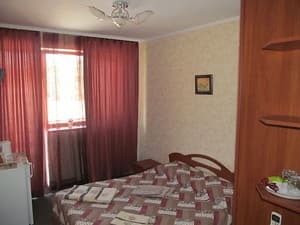 Guest house "U Milanki" is located in a quiet area of ​​Sudak - in the cottage at the foot of the mountain Alchak. The distance to the beach is 10-15 minutes walk. 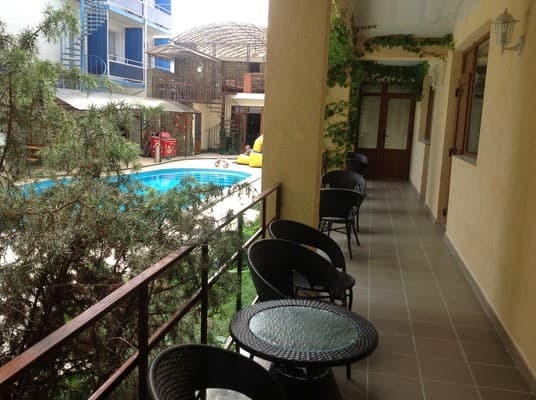 The hotel has a courtyard surrounded by greenery, an outdoor swimming pool, comfortable rooms of the "Standard" and "Junior" class with a separate exit to the balcony or terrace, overlooking the Crimean mountains. 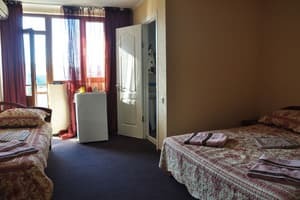 Each room has modern furniture, a separate bathroom (cold / hot water), air conditioning, LCD-TV, dishes, electric kettle, refrigerator, towels, hair dryer. 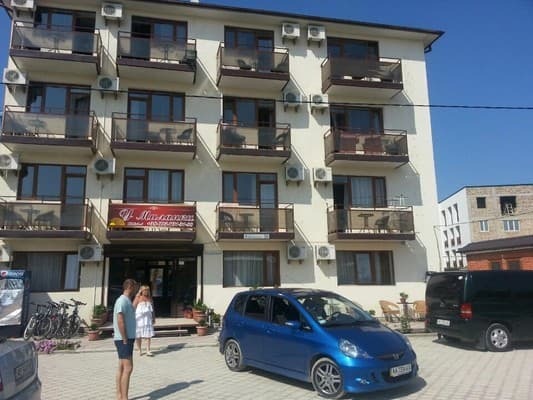 In the whole territory of the guest house "U Milanki" - access to the Wi-Fi network. There is a free fenced car park for guests. For children - a large inflatable trampoline in the courtyard of the hotel, children's toys, children's games. To ensure the safety of tourists, 24-hour security is functioning and video surveillance is being conducted. The facility is under the protection of the specialized unit "Bars". On the territory of the hotel "At Milanki" work exotic tea-house, cafe, bar. The distance to the bus station in Sudak is 2.3 km. PRICES MAY CHANGE, IT IS REQUIRED TO RECEIVE INFORMATION FROM THE OPERATOR. Description of the room: One room with a double bed, has a separate exit to the terrace. 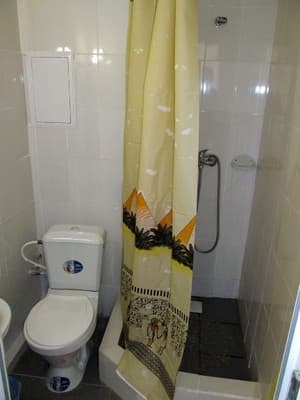 Equipped with modern furniture, private bathroom with cold and hot water. The room also has an LCD-TV, an electric kettle, a hairdryer, a set of dishes, a set of towels and everything necessary for a comfortable stay. An iron and ironing board are provided upon request. Description of the room: One room with a double bed, has a separate exit to the balcony. 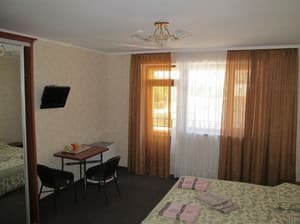 The room is equipped with modern furniture, a private bathroom with cold and hot water, LCD-TV, electric kettle, hairdryer, set of dishes, a set of towels and everything necessary for a comfortable stay. The balcony has rattan chairs and a small table. An iron and ironing board are provided upon request. Description of the room: One room with a separate exit to the terrace. Modern furniture, separate bathroom with cold and hot water. The room also has an LCD-TV, an electric kettle, a hairdryer, a set of dishes, a set of towels and everything necessary for a comfortable stay. An iron and ironing board are provided upon request. Children under 3 years stay free of charge, from 3 to 12 years - 50% of the cost of living. The guest house is located in a quiet and peaceful area - in a cottage town at the foot of Mount Alchak. 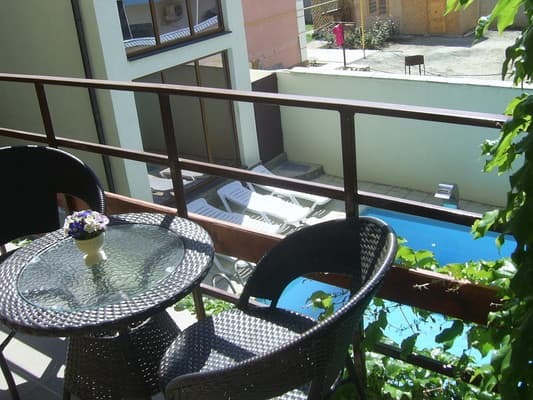 Nearby - Aquapark, various cafes and restaurants, local colorful resort market. The road to the sea - 10-15 minutes, to the water park - 7-10 minutes. The distance to the bus station in Sudak is 2.3 km. They decided to go by train or fly by plane better to go to Simferopol Crimea, then you need to get by taxi or shuttle bus to Sudak (107 km). Marshrutki (and buses) are sent from the bus station near the railway station, then by taxi to the guest house near Milanki at ul. South Coast 56. Transfer is available upon request.